Wow! Huge difference. Love the before and after. Hard to believe it is the same place. I like to scroll down just enought so I don't get to see the 'after' before I soak in the 'before.' I have to admit, I was wondering how you could make THAT pretty. I lack creativity, apparantly ;) After soaking it in, I slowly scrolled down, imagining drumrolls in my head and . . .WOW . . what a transformation! It's out of a magazine! Plus, no wall demolition . . . anyone can do it!! YOU ROCK! Absolutely unbelievable! You are awesome! By the way, your blog is the one blog my husband will look at with me because he wants to one day buy a fixer upper. Maybe, but I am totally lacking in the creative department. I love your style! Oh my, this is amazing that it is the same entry! It looks fabulous. Amazing how the floors and painting out the trim makes a world of difference. That is truly amazing! Wow - the wallpaper before... I love it! I am excited about your Favorite Things party! 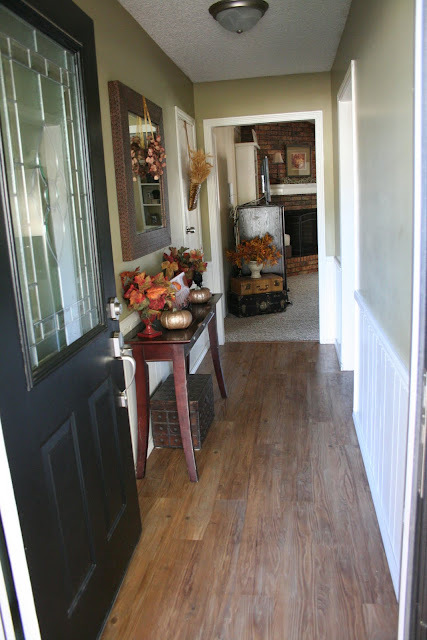 I love that flooring, it's so easy to install. We put it in our Laundry room. Cleans up really nicely too. Nice make over! I am *almost* speechless...How you saw any potential in that dark dreary and ugly entry way is beside me and then you took it so above and beyond and for so little money...I'm back to "wow"...sooo glad that you thought to get before pictures!! LOVE that door! You are very lucky to have a handy husband. It looks great! What a beautiful job the two of you did. I just love it. The wallpaper just wasn't you. I am so loving the color and the mirror is so exquisite. I love it. The door is so pretty. I love light coming into a room. It says Welcome Home. The little hall table is so beautiful under the mirror. Gives it that homey look. Thanks for sharing sweetie. Please stop by and say hi. I would love to share my story with you today. This is quite a transformation, Melissa! Much brighter with that door and I love what you did in your entry. Very welcoming! What a beautiful job. I love it all. Matter of fact, I saved it in my inspiration file. If you don't mind, can I ask how big your foyer is? Mine is similar in style and appears, size. I would love to be able to do something like that. It looks great! I love the painted paneling!! And you did it all for such a great price!!!! Thanks for sharing! It's beautiful; your efforts will certainly pay off! GAH!!!!!! You used one of my all TIME FAV COLORS - Ben Moore Baby Turtle - that color looks good EVERYWHERE. It's gorgeous. LUV THAT ENTRYWAY. Can't believe the difference. Looks so much better--and on the cheap! Ya done good! Wow, what a difference! And for so cheap too!! Gorgeous. Beautiful. Lovely. Add all positive adjectives here: _________! beautiful job!!! i love the paint color. Wow!! Okay, I actually flinched a little bit with that first pic. What a gorgeous entry now, though. There could be no warmer a welcome. Great job! It really looks much better. You two make a great team! I love it and can't wait to see more. your house has been such an inspiration for me and the things I'm doing to our (new) house! thanks!! I think I would have turned around and walked out as soon as the realtor opened the door on the initial showing! Whoa!!! Huge difference! It looks beautiful! Looks amazing! I had to keep scrolling back to make sure it was the same house! I also love your entry table and mirror as well as all your fall decor, you are so talented! You really lightened things up! Great job. What a transformation!!! LOVE IT!! What a beautiful entryway! It's is so warm and welcoming. you're so talented! love love love it! Luuuv it! I don't even think it looks like the same house. You did an awesome job! What a change ~ it looks great! Wow! What an amazing change! It looks wonderful. Wow! What a difference a little elbow grease and a wee bit of money make! Looks beautiful! You guys did a great job! Love the makeover, fabulous job. Are you planning lots of changes to your new house? That is a wonderful transformation. Even greater that you did it yourselves and saved a ton of money. That was a complete face lift! 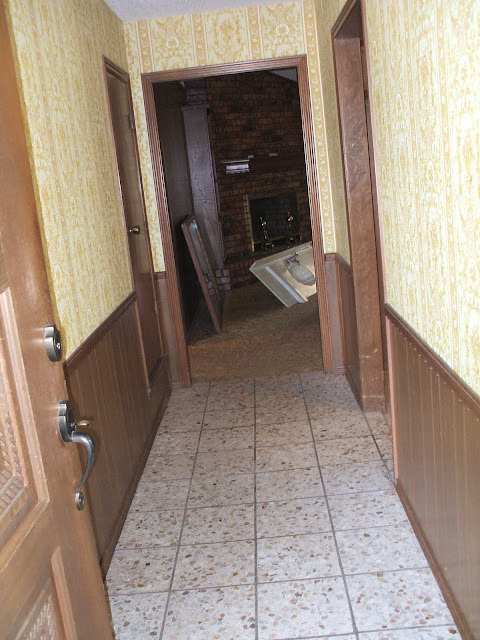 It makes me happy knowing that that lovely home was hidden behind the outdated tile and paper. What a gift you leave to the future owners! Beautiful makeover. Love the baby turtle. BEAUTIFUL!! What a huge difference!!! love that beautiful color!! Works well with the black door! ..Hey!! I need a black door, too!! You have inspired me! Wonderful transformation! We have a very similar door-painted cream. Our old one was all wood too. Love the light it lets in. WOW! That is a BIG change So nice!! Gorgeous and so inspiring! Thanks for sharing!!! I love your hallway. It is a real inspiration, can't wait to try something similar in our entry way! Melissa you are amazing. I miss you and hope your family is doing well.